2015 FENDER CUSTOM SHOP Custom Deluxe Stratocaster 2014 Spec - AAAA Quilt - Crimson Red Transparent. Brand new, un-played, not been a demo in a store. Genuine made in USA. 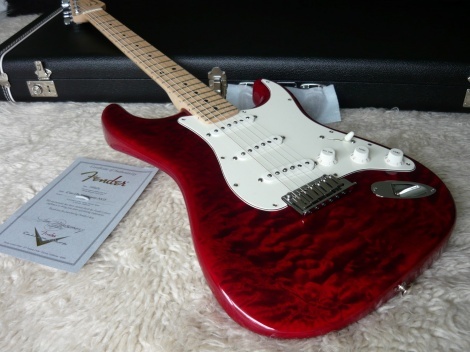 This is an absolutely stunning extremely playable - tone to die for Custom Shop - Master Built Strat. True MOJO - Action is fast & low - beautiful eye candy - with the finest materials available for the player who demands a high end boutique instrument. It sounds like a dream. It has elegance, style & grace. Hand wound '60s spec pickups. A checklist of high-end features including AAAA tonewoods and hand-wound pickups. This 2015 Custom Deluxe Stratocaster encompasses favourite tonewoods, with a hand-selected alder body beneath the kind of AAAA quilt maple top typically reserved for Fender Custom Shop - Master Built instruments, all with an elegant Gloss finish. The AAA bird's-eye maple neck is topped by a 9.5"-radius rosewood fingerboard with 22 medium jumbo frets. The three hand-wound '60s-spec pickups include a Fat '60s bridge pickup and a reverse-wound/reverse-polarity middle pickup that produces humbucking "in-between" sounds.